When I graduated high school I was a trim size 6 and 11% body fat (nearly all of which was supported by my bra). I weighed 145 pounds and my doctor told me that with my 5’2″ frame I should weigh around 115. I had heard from various people who mattered to me that it was important to watch what I ate because my genes predisposed me to getting very large and they gently but consistently pushed me to stay thin so that I could stay healthy. I didn’t (yet) get that skinny is not the same as healthy. This post may contain affiliate links. View our Terms & Disclosures. What no one saw was that I had wavered back and forth for two years already between anorexia and bulimia, trying to feel good about myself and to get everyone to stop commenting so much on what I was eating. I would starve myself for months, and when someone started to notice that, I would start eating and taking pills and purging. I lived in this cycle for nearly twelve years. I was thin, but never healthy. Never. I strove for skinny, not understanding that skinny is not healthy. And then, I wasn’t skinny anymore. I became overweight and unhealthy. And then obese and unhealthy. And then morbidly obese and unhealthy. On my 19th birthday, I weighed 199 pounds. I remember looking at the scale in shock and crying. My best friend picked me up, told me I couldn’t be sad on my birthday and took me out for a dinner filled with trans fat and empty calories to help soothe my sad heart. I had started to gain weight in response to a personal trauma that I tried to fix with comfort food. It didn’t work, but my body to this day carries the reminder of that trauma because it still carries that weight. My body was most definitely suffering, but my mind and my heart were suffering even more. have been on a journey to heal my broken body so that my external self reflects my healthy, joy-filled, whole internal self. When I became pregnant with our first child, I left my eating disorder in the past once and for all because I valued her little life so greatly. I wish I could say it was because I had begun to value myself, but that part of my victory came later. Even now I have to check my mental responses to food and remind myself that it is not my master. Neither is a number on the scale or even a favorite pair of jeans. God is the only Lord of my life and I refuse to make food, weight, size, health, or fitness an idol ever again. Well, I have stopped dieting. I eat a very healthy, whole food oriented menu that is satisfying and delicious. I spent more than five years reading and researching about food and body types and what was going to heal my body from the extreme damage done by a decade of disordered abuse. When I finally found what was working and began to heal, I didn’t lose anything. I kept telling myself I would be content with a healthy body, even if it was morbidly obese. However, I struggled to be content and I was determined not to associate health with size/weight. I began to learn about valuing myself, no matter what I looked like. Skinny is not healthy; loving yourself is. One day a friend told me about this book called Trim Healthy Mama by Serene Allison and Pearl Barrett. I avoided reading it for six months because I was never going into the diet addiction phase again; to me, that was swapping one eating disorder for another. However, as I watched her family get healthier and healthier, I became curious enough to get a copy of the book. I’m now down thirty pounds and have been stalled for a season on weight loss, even though I’m still shedding inches. And I feel great! But more importantly, I feel free. Being bound by food is no longer a part of who I am! I also began giving my body the supplements it needed. I had always shied away from that investment before, but as I began to love myself I realized it was okay to invest in myself. So I started taking the best multivitamin, probiotics, and omegas I could get my hands on. I love me, and that’s not selfish. It’s actually very healthy. I love me, whether I’m skinny or not. I also added another key element of health: exercise. But a different kind than I had ever tried before. I am now a “T-Tapper!” T-Tapp was designed long before I ever started working out, but for some reason, I’d never heard of it. Perfect for me with its 18-minute routine (hard to find time to work out with six kiddos! ), lack of pressure on my knees, and no weights (so I can do it anywhere I have the time), it’s pretty awesome. I’ve worked on learning the proper form for each move, and as I learn my results grow. But I’ve seen people I know get great results on healing their bodies, not just their shape, and I want those same results. Why am I doing all of this? Not because I need it for my self-esteem or for my husband to love me and find me attractive. Not because I have some inner compulsion. That’s not who I am any more. But because, as you can see in my photo, I have six (update: now eight!) precious children that I want to have the energy to play with and keep up with. It’s my God-given responsibility as their mother to disciple them – to teach them to steward the life God has given them body, soul, and spirit. This is part of it. Do You Struggle With the Believing that Skinny Is Not Healthy? Why am I sharing all of this with you? Because I know there are other women who have been lied to and told that skinny equals healthy. 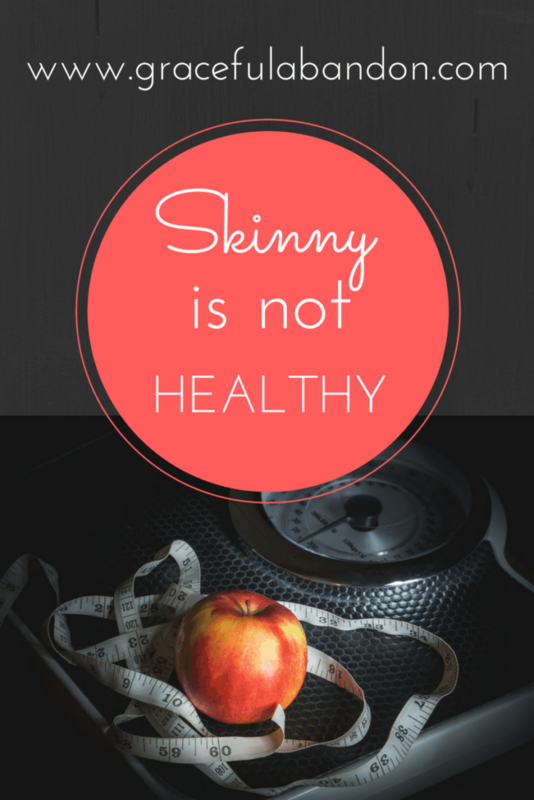 Skinny is not the same as healthy!!! Maybe you’ve believed that self-deprivation is the only way you’ll really be beautiful, that starvation is the only way you can look gorgeous. Or maybe you eat because you can’t seem to help yourself and you feel like a failure every time you’re done. Or maybe you think about your next meal all day long, and miss being able to just live. 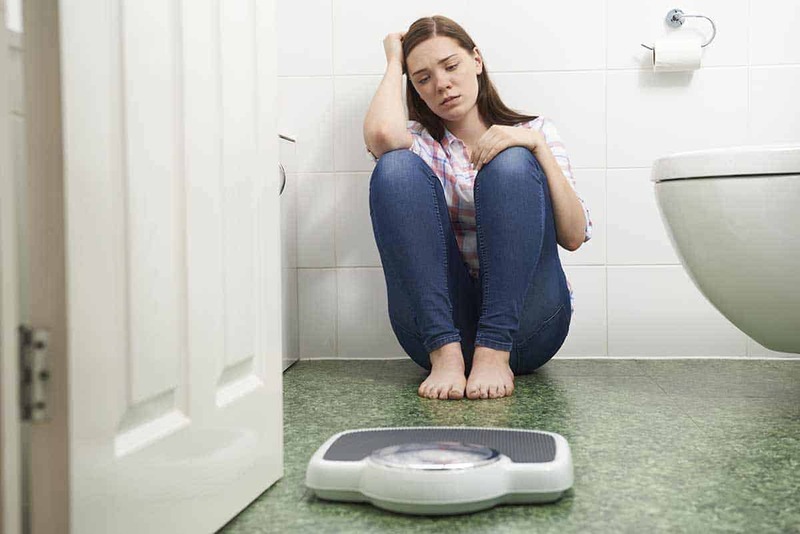 Maybe you’ve never felt any of this, but you are overweight and feel like there is no hope. Maybe you look in the mirror and wish you could love what you see. Let me tell, you sweet sister, there is always hope with God. He is able to heal you, inside and out. You are beautiful and lovely and worth loving EXACTLY the way you are. Stop hearing the lies. Please, if you’re on this journey, let me know! I’d love to pray for you and encourage you. God bless you on your journey, you have an amazing testimony! He is faithful, and He will give us what we need to tarry on!! Thanks for sharing! Thanks so much, Lill! Be blessed! Thank you for posting! Food can so easily become an idol and take complete control of your mind. After graduating college, my weight dipped dangerously low for a couple years, hovering over 100 lbs. (I’m 5’4″ and small-framed). Size 1 didn’t look healthy on me at ALL. It started affecting my heart and my reproductive health. But I couldn’t let it go– it was all a control issue. I thought I was controlling myself, but in reality I was ruining my life. Once I got some spiritual issues resolved and started thinking Biblically about my life, things turned around. I eat a healthy diet and don’t worry about scale numbers anymore. I feel so much better, look a lot better at size 6 (my husband agrees!) and have two beautiful babies. God was so good to rescue me before I did permanent damage to myself. Blessings to you on your journey to good health and right thinking as well! Thank you for sharing. It’s amazing, truly awesome really, how much our spiritual life impacts everything. God is the center of it all! I have just completed my first week on plan. Thanks for sharing your heart. Congrats on the first week of a new lifestyle! Are you in the Beginners group as well as the main FB group? The link is on the THM website. It’s a great little starting place; I’m in there a lot. You can click on my In the Kitchen page on the top of the blog as well and see links to my menus and frugal posts. I’ll be happy to help any way I can! God bless your journey. Thank you. I didn’t realize there was more than one fb site I will check that out as well as your kitchen. I’m definitely praying for you! Good for you! I have been T-Tapping for about 7-8 years, and it has changed my life. I just discovered THM recently and have been loosely following the plan for a few weeks now. I, too, was thin and unhealthy when I was young, though I was never anorexic. But I am right there with you on the journey. Let’s encourage each other! What a beautiful message. Your story has many similarities to mine, and I think our family may too, as I looked at your youngest daughter’s sweet cheeks 🙂 AMEN to the T-Tapp- it is amazing, and through it I have found “fit” without “freak” at last! If you haven’t found the FB group “Trim Tappers”, you should- it’s like having a fitness family to love you too! God bless you! Hi Julie, I’m in the Trim Tappers group as well 🙂 I’m just starting so not super active in there yet. Thanks so much for swinging by and visiting. Hope to “see” you again. Be blessed! I just wanted to share that I have just started THM but I started T-Tapp last year and quickly lost 36 inches BUT life got crazy and I stopped tapping and promptly added inches back! Well, that is how life goes, right? up and down….the great thing about this is that I KNOW that it works!! and all I need to do is get back to it. I think THM and T-Tapping together is gonna BE AWESOME!!!!! I will pray for you and this exciting journey! That’s such an awesome testimony! Thanks for sharing with me how quickly you lost. I hope you’ll join me in jumping back in! THM is a blessing; I’m sure you’ll be so encouraged on this journey. I LOVE this. It is so beautiful! Thank you for sharing your journey. And I want to slap your doctor! I can’t believe someone would say that to a teenager! You know, I think back then it was all about BMI. I’m so glad my kids are growing up in a home where that isn’t the focus. God is a Redeemer! Thanks for taking the time to comment. Thank-you so much for sharing your story with us. I too struggle with an eating disorder and would appreciate prayers. You’ve got them! Praying for you right now and in the future on your journey. Thanks so much for sharing honestly. This issue is so prevalent and yet so hidden. Bless you for being willing to share what God has done in your life. Jennifer, thank you so much for stopping by. I just wanted to say how awesome you are! God bless! My husband and I recently lost 70 pounds each and both suffer from food addiction. It is a hard road that is for sure, but worth it. We did it for our children too (all eight of them). Focusing on God, my family, and my health made it happen. Well, thank you! And congrats to you and your husband both — on your weight loss and your beautiful family. Hi Diane, that is great…I will def add you to my prayers. Looking forward to seeing you again around here. Thanks for sharing– this really ministered to me! In my early 20’s I healthfully lost and kept off 80 lbs for nearly 10 years before getting pregnant with my daughter. I swore I’d take off the 65 lbs of pregnancy weight quickly– which I managed by her first birthday with super restrictive dieting. Super restrictive dieting which back fired and now my weight is all over the place and have really been struggling for the past year. I just stumbled across Trim Healthy Mama today and ordered the book right away. Really getting encouraged by posts like your’s and all that I’m reading. I know my body needs to heal and stabilize. I’m excited for you. I myself had to realize that I was sinning by eating emotionally or when bored or when facing problems. I know little about THM but I think its a great way to eat healthy. I can’t get myself started yet because of all the planning and trying new stuff. I found freedom from overeating through settingcaptivefree.com the course is called: The Lords Table(a great website for finding freedom from addiction and sinful habits- it covers many topics). I had an online mentor that was helping me to stay with the course. I praise God for showing me the truth. I have never heard of that course, but will check it out so I can share with others. Yes, THM is a new way to live, but we love it because we aren’t living without. We do it without a lot of the specialty stuff around here because frugality reigns. Thanks for sharing! WOW… thanks for sharing your story!!! I have always had weight issues all my life. My stepmom used to say “why can’t you be skinny like your brother & sister”. Well then I would always find a cookie & eat it in hiding for comfort. I am now married & in my 50’s and God hasn’t allowed us to have children. I have started using Wildtree products in my cooking because my doctor said I should start eating more healthy & to cut sodium from my diet. I have since cut my blood pressure medicine in half and to all the blood work the last 5 years have a clean bill of health, THOUGH I still look fat on the outside. It has affected me a lot in the last 2 years… that when I am around people I am afraid that they are watching exactly how much I eat. So God is still working at healing those inside hurts that no one sees and am so glad HE LOVES ME the way I am. I encourage you to continue this journey to freedom and health. Rarely is it easy, but it is always worth it. Be blessed as you revel in God’s delight of you and passion for you. Lisa, Thanks for sharing. In my past, I too struggled for about 12 years with an eating disorder. I’ve seen people talking about Trim Healthy Mama and like you said, I don’t want a diet to be hooked on. It took years to change how I look at food. But, I may check out what this book says. For me, THM has been liberating! I’m so glad to hear you have found victory and are dedicated to maintaining it. I encourage you to look at my menu plans (on the tab “in the kitchen” and see what I’m eating — you’ll see I’m not starving at all!) and read some of my posts. It’s been great to learn what I can eat and then just do it as I live. I truly enjoyed reading your story, as it was very inspiring to me. I have often said that food can be just as dangerous of an addiction as alcohol, but in a way, it can be worse. You need food to survive, but not alcohol. I have been trying to gain control of my eating and stop the mindless, stress eating that I all to often fall into. I have two small children and I would love to be able to be as active as they are. All to often, I fall into the trap of excuses, fast food is quick and cheap,(although I rarely buy it for the family), exercising is too hard with two children( no time, no room, etc.) somebody stressed me out so therefore I must eat a whole bag of cookies or chips, etc. Although I did give up drinking pop and I feel a whole lot better, sometimes it just doesn’t seem like enough. I know I didn’t put the weight on overnight, and it will take a while to lose it, but sometimes I get impatient. I really need to involve God in my journey, as I see you have done, because I can not do it alone. Thank you once again for sharing your amazing story, good luck on your future journey, look forward to reading more about it. God needs to LEAD your journey. When you follow Him, everything changes. ONLY He can do that. I will be praying for you. I hope you’ll feel free to come back and visit here and let me know if you need some encouragement. Weight does take time to come off, it’s true, but it’s well worth investing in — because YOU are worth investing in. Another reader told about an e-course they took called The Lord’s Table put out by the ministry Setting Captives Free that has helped them conquer their addiction. I’m in the process of reading through their course and like what I see so far. Maybe something like that would be of help? It’s totally free, so it’s worth looking at. And as for exercise, take your kids for a walk, chase them at the park, jump up and down with them. We have a VERY small home for the quantity of people who live in it, so I feel your pain. T-Tapp is how I have chosen to go because it takes four square feet, which is so convenient. We each need to search for what works for us when it comes to exercise, but it’s important for your overall healthy. Be encouraged, and let God lead you. What exactly is t-tapp? Don’t think I have ever heard of it. I will for sure come back and visit your blog again, very encouraging, thank you. T-Tapp is a fabulous program that works the muscles in your body in a way nothing else I have ever seen or tried has done. In three days, I can see a difference in my shoulders! It’s intense without using weights or impact. Pretty awesome. I have been hearing about T- Tapp for awhile. Where would be a good place to start. Budget is an issue. I have almost hit my year mark with THM. I have lost almost fifty pounds. I have been spinning for almost a year but having a hard time finding time to go to class. Been trying to find something to do at home. Any advice would be great. Kristina, I am new to it and am doing the Basic Workout Plus for starters and then moving to the Total Workout! I posted a link in the article (it’s a referral link), but if you click on it it will take you to a main page and on the bottom just to the left of middle will be an option for “January Specials.” Personally, I would start there! You can’t go wrong with either the basic or total packages, as they are the original, core programs. The reason I went with the total package was to the get the Cellulite Removal Skin Treatment system, which I have done some for me of for a while now and love (and it’s just a great deal rolled into the package!). I read thm and lost some weight after being on steroids for a time. My biggest hurdle is eating when I am not hungry. I seemed to do ok on the plan but then I found my self eating all the time and gained all the weight back. Now I am back to my steroid weight gain and need to lose 10-15 lbs to be healthy. I don’t want to allow any food program/style to become an idol nor skinny to be an idol. I just want peace and joy and not to worry or fret over eating! I want to keep in check eating smart and good choices not being lazy but also not so focused on what I will eat or prepare because I get so obsessed! Any suggestions? Pray. Seriously, at the start of each day, dedicate ALL of your decisions to God. Not just food choices, but all of them. That is always my first step. When I am grounded in the Word and living in submission to God, all the rest of my life goes better. As for healthy living: When I first started THM, I took my desires out of it. I literally set a timer in my phone for 3 hours and ate each time it went off. I pre-portioned snacks and put a menu plan on the fridge for each day. It took about a week and a half for me to get the swing of it and start to reset my body. I wouldn’t even worry about S or E if that overwhelms you; just eat healthy foods every few hours. I think that when I exercise, I am less stressed and happier with myself and make better choices, so these days I try to T-Tapp at the beginning of each day, or during my mid afternoon slump. My name is Megan, I’m 16 and have been struggling with eating disorders and depression for the past 4 years. Specifically I struggle with anorexia and the ‘binge/purge’ cycle – I haven’t had my period for about 3 years. I’ve dieted on and off and did do Trim Healthy Mama for a while which was very healing… but life happened and now I’m currently underweight with malabsorption issues in my gut. Because I’ve been stressed out, undernourished and low-fat this past month my body isn’t absorbing any of the food I eat very well so I’m having a very difficult time gaining weight and staying at a healthy weight. As a christian, I love Jesus and want to honor him in my body, my health, and how I eat. I have a lot of healing to do and I’ve already resigned myself to never having a menstrual cycle again. Your testimony has been very encouraging to me and I ask that you please pray for me as I seek to break free from my eating disorders, maintain a healthy weight, and establish a healthy, balanced, sustainable way of eating that works for me. I so appreciate you speaking truth, we need it to combat the Devil’s lies! Thank you again!! If you have any tips or wisdom in regard to dealing with disorders and healing my body, feel free to write me! Megan, I am most definitely praying for you! There *IS* victory to be found in Jesus. Thank you for sharing your story–it is inspiring! I’ve been struggling with my weight since I joined the ranks of full-time office worker (since my early 20’s). I was diagnosed with Hashimoto’s (thyroid) disease in my early 30’s and am still struggling with the fallout from that. 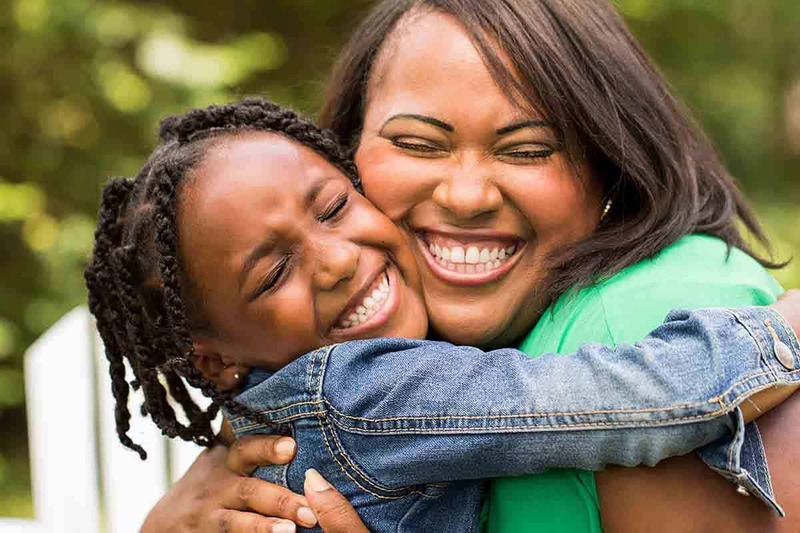 I love your positive attitude – your family is blessed to have you!! Thanks so much, Sandi! Skinny is a struggle, isn’t it? But healthy — that’s a victory we can all share!